In this detailed Resource page, we feature an abundance of AWT Tutorials! Exception handling is the process of responding to the occurrence, during computation, of exceptions – anomalous or exceptional conditions requiring special processing – often changing the normal flow of program execution. It is provided by specialized programming language constructs, computer hardware mechanisms like interrupts or operating system IPC facilities like signals. Software exception handling and the support provided by software tools differs somewhat from what is understood by exception handling in hardware, but similar concepts are involved. In programming language mechanisms for exception handling, the term exception is typically used in a specific sense to denote a data structure storing information about an exceptional condition. One mechanism to transfer control, or raise an exception, is known as a throw. The exception is said to be thrown. Execution is transferred to a “catch”. From the point of view of the author of a routine, raising an exception is a useful way to signal that a routine could not execute normally – for example, when an input argument is invalid (e.g. value is outside of the domain of a function) or when a resource it relies on is unavailable (like a missing file, a hard disk error, or out-of-memory errors). In systems without exceptions, routines would need to return some special error code. However, this is sometimes complicated by the semipredicate problem, in which users of the routine need to write extra code to distinguish normal return values from erroneous ones. In this tutorial we will discuss about Java’s UnsupportedClassVersionError and how to deal with it. The UnsupportedClassVersionError is a sub-class of the LinkageError class and specifically, of the ClassFormatError class. In this tutorial we will discuss about Java’s NoSuchMethodError and how to deal with it. The NoSuchMethodError is a sub-class of the LinkageError class and denotes that an application code is trying to call a specified method of a class, either static or instance, and that class has no longer a definition for that method. In this tutorial we will discuss How to solve No Class Def Found Error (NoClassDefFoundError). This error is thrown when the Java Virtual Machine (JVM) or an instance of the ClassLoader class tries to load the definition of a class, but the definition could not be found. In this example we will discuss about AbstractMethodError. As you may have figured out, this is thrown when the application calls an abstract method. Java supports the creation and manipulation of arrays, as a data structure. 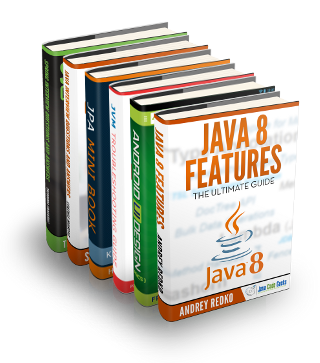 A bunch of Java data structures are implemented using arrays to store and expand their data. Thus, arrays are massively used in programming, as they provide a very fast and easy way to store and access pieces of data. In Java, a special null value can be assigned to an object’s reference and denotes that the object is currently pointing to unknown piece of data. A NullPointerException is thrown when an application is trying to use or access an object whose reference equals to null. The UnsatisfiedLinkError is a sub-class of the LinkageError class and denotes that the Java Virtual Machine (JVM) cannot find an appropriate native-language definition of a method declared as native. This error exists since the first release of Java (1.0) and is thrown only at runtime. This exception is thrown in order to indicate that a method has been passed an illegal or inappropriate argument. For example, if a method requires a non-empty string as a parameter and the input string equals to null, the IllegalArgumentException is thrown to indicate that the input parameter cannot be null. This exception is thrown during a failed attempt to open the file denoted by a specified pathname. Also, this exception can be thrown when an application tries to open a file for writing, but the file is read only, or the permissions of the file do not allow the file to be read by any application. This exception is defined as the superclass of all exceptions specific to Object Stream classes. The ObjectStreamException is defined as an abstract class and thus, an instance of ObjectStreamException cannot be created. In this tutorial we will discuss about ClassNotFoundException. This exception is thrown when an application tries to load a class through its string name, but no definition for the specified class name could be found. In this example we are going to talk about a very common exception that many java developers stumble upon when dealing with IO operations in their program : IOException. This exception occurs when an IO operation has failed for some reason. In this tutorial we are going to talk about java.net.UnknownHostException. This is a subclass of IOException, so it is a checked exception. It emerges when you are trying to connect to a remote host using its host name, but the IP address of that host cannot be resolved. It is a subclass of IOException so it is a checked exception. What you should know is that MalformedURLException is an exception that occurs when you are trying to connect to a URL from your program but your client cannot parse the URL correctly. This is an unchecked exception and it can occur when you are trying to convert a String to a numeric value, like an Integer or a Float, but the String is not well formatted for the conversion. In this example we are going to talk about java.net.SocketException. This is a subclass of IOException so it’s a checked exception. It is the most general exception that signals a problem when trying to open or access a socket. In this example we are going to talk about java.net.SocketTimeoutException. This exception is a subclass of java.io.IOException, so it is a checked exception. From the javadoc we read that this exception :” Signals that a timeout has occurred on a socket read or accept”. In this tutorial we will discuss about NotSerializableException in Java. The exception is thrown when an instance of a class must implement the Serializable interface. In this example we are going to talk about java.text.ParseException. This is a checked exception an it can occur when you fail to parse a String that is ought to have a special format. One very significant example on that is when you are trying to parse a String to a Date Object. In this example we are going to talk about java.rmi.RemoteException. This the most general checked exception that may occur during the lookup or the execution of a Remote Procedure Call (RPC). In this tutorial we will discuss about UnsupportedOperationException in Java. This exception is thrown to indicate that the requested operation is not supported. In this tutorial we will discuss about the IllegalMonitorStateException in Java. This exception, when thrown, indicates that the calling thread has attempted to wait on an object’s monitor, or has attempted to notify other threads that wait on an object’s monitor, without owning the specified monitor. In this tutorial we will discuss about the EOFException in Java. This exception indicates the the end of file (EOF), or the end of stream has been reached unexpectedly. The ConcurrentModificationException is a RuntimeException that may be thrown by methods that have detected concurrent modification of an object, when such modification is not permissible. In this example we will look briefly at the basics of Exception, in Java Programming Language. We will also see, how to create a custom Exception Class.